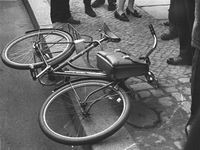 Rudi Dutschke, one of the leaders of the German Socialist Students Federation (SDS) is shot in the head by a right-wing extremist. The shooting is the culmination of a venomous hate campaign against Dutschke and the SDS orchestrated by the right-wing media, which portrays him as an evil radical who must be ‘stopped’ at all costs. Dutschke survives, but with serious lasting injuries. After the shooting, Dutschke writes to his imprisoned assailant, Josef Bachman, and urges him to turn his energies to fighting against the capitalist system rather than against those who seek to bring about change. Bachman thanks Dutschke and says that Dutschke is not at all like he had been led to believe by the media. When Dutschke hears that Bachman has attempted suicide in jail, he writes to tell him that he should not despair; that he will no doubt be released from jail in the not-too-distant future, and that he will then still have a long productive life ahead of him. Nonetheless, Bachman does eventually commit suicide. Dutschke dies twelve years later as a result of the long-term effects of his injuries. Beginning of the Common Front strikes in Quebec. Over 200,000 public sector workers go on strike against the government, and Quebec grinds to a halt. The workers’ demands include a pay increase to match inflation, a say in working conditions, and equal pay for equal work. The Quebec government tries to break the strike with injunctions, arrests, huge fines imposed on striking workers, and finally back-to-work legislation, imposed on April 21. When the striking workers go back to work after April 21, the government sets out to teach them a lesson, and jails the leaders of the big three union federations. Within hours, workers walk off the job again, and this time the strikes spread far beyond the public sector, turning into a general strike with more than 300,000 workers off the job. 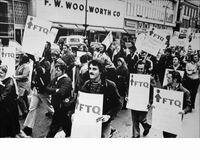 Workers seize control of 22 radio stations, and force anti-union capitalist newspapers to stop publishing. In the end, the government agrees to free the jailed union leaders, and the workers agree to return to work. Venezuelan President Hugo Chavez is overthrown in a military coup. The United States, which has been involved in planning the coup, instantly recognizes the new ‘government’. 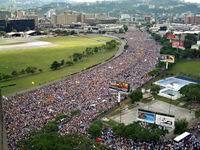 However, massive popular protests force the military plotters to give up, and three days later Chavez is restored to the presidency.